Beautiful videos, stunning images, and immersive sound — take advantage of the streamlined, innovative tools that give you the power to present your design vision like never before. Walk your clients through an interactive 3D tour. Create a 3D video complete with richly layered sound, text, and images. And use the easy Media Viewer to access all of your media with just one click, instantly ready to share. Create revolutionary videos. Easy as 1, 2, 3. 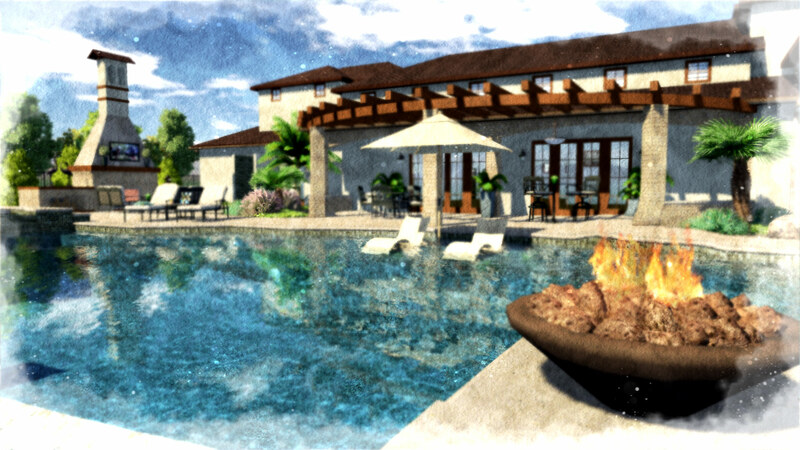 Create a professional video, with the presentation features of your 3D pool and landscape design software. It’s never been easier or faster to edit your own videos, with revolutionary tools you can master with simple clicks. First: Simply select important design features in your project, and set the viewpoint on them. Your video storyboard will be created and saved automatically, along with any day-to-night transitions and artistic effects you choose. Second: Add stunning effects to your video, such as fade to black, cross fade, or hard cut. It’s easy to import images, title screens, text effects, and more. Third: Click “Record” and the powerful video tool will render your MP4 video in up to 1080p and 60fps, ready for you to upload directly to YouTube or Vimeo to impress your clients and colleagues. Engaging, fully interactive 360° views of your designs. 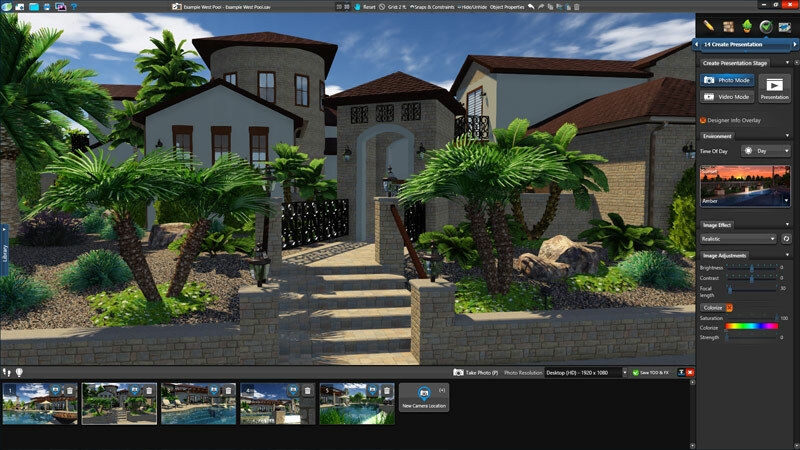 When you use Vip3D pool and landscape design software to create interactive 360-degree screenshots, images, and videos — you’ll be able to share with your clients the easiest, most engaging new way to explore every detail of their future outdoor living space. Immerse your client in an unforgettable backyard experience. 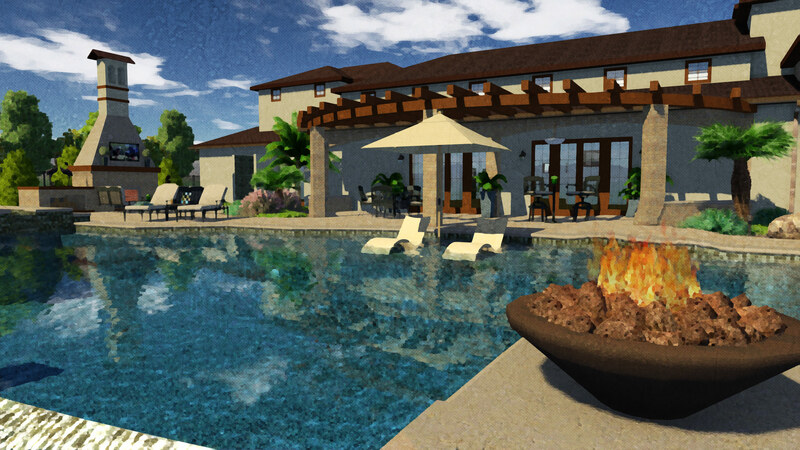 Bring an incredible new level of realism to your 3D outdoor living presentations with custom sound objects. With streamlined tools in the landscape design software, select and add custom sound files anywhere in your project. You can demonstrate outdoor speaker placement, the ambiance of nature, a light breeze, bubbling water, or even add your own narration with a simple click. 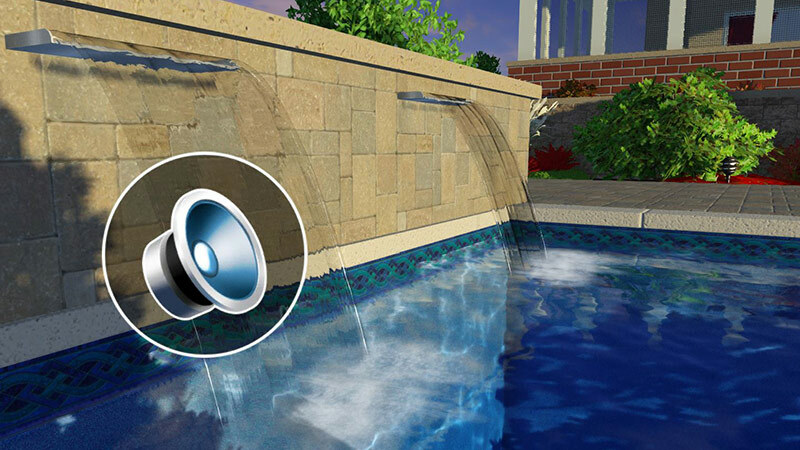 Delight your client by revealing the tranquility of their backyard escape and show how the gentle sounds of a pool will make neighborhood noises fade away. Revolutionary, groundbreaking, and frankly breathtaking — Virtual Reality for Vip3D is here, ready for you to amaze your clients and connect them to your design like never before. With the Oculus Rift headset, transport your clients to explore their future outdoor living space in unprecedented depth and detail, creating an immersive experience like none other. Beautiful before and after comparisons, simplified. With the uniquely imagined Photo Mode, you can save multiple views of your design in a single project. 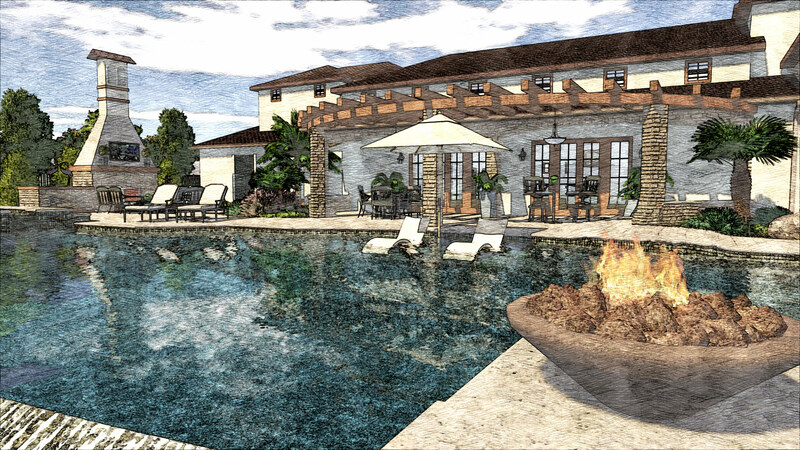 Today’s pool and landscape design software makes it easier than ever before to change quickly between views as you make revisions to your design. To achieve that perfect shot, you can save individual artistic settings to each frame, and save time-of-day settings. Once you’ve found your best shots, leave your client speechless with JPG or PNG images in up to 8K resolution. Do more than just showcase a great design. 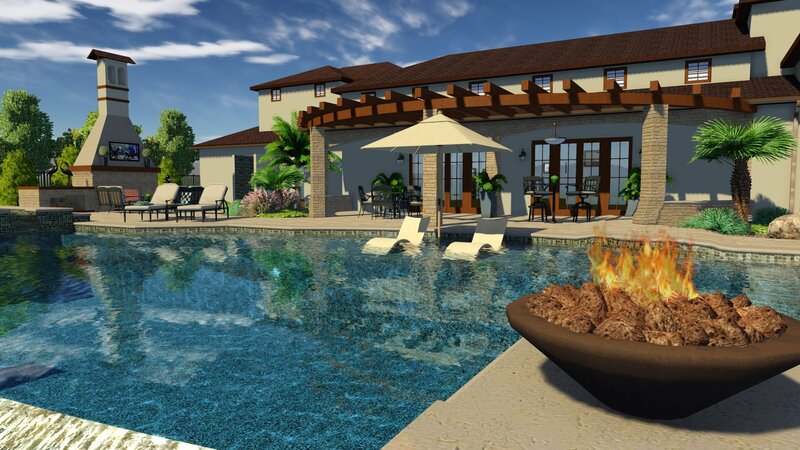 Professional pool and landscape design software offers powerful, precise tools so you can reveal to your client the extraordinary details you custom picked to match their lifestyle. 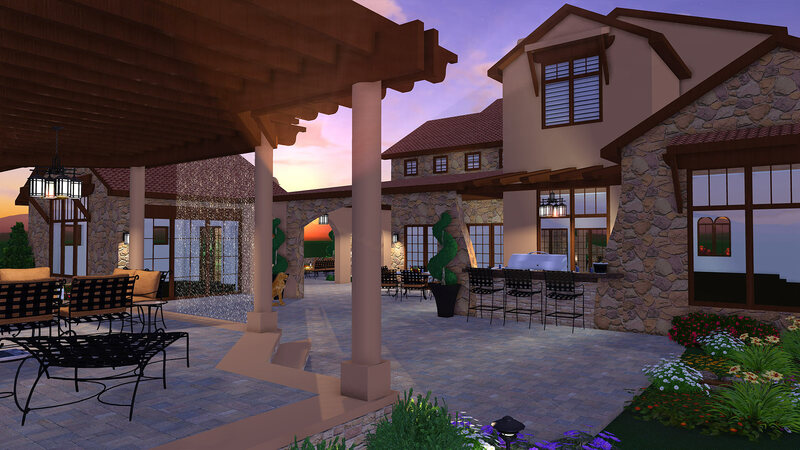 When you’re not restricted to a flat, 2D presentation of your design, you can watch your client’s enthusiasm grow as they see the sun set over their property and the lights turn on. 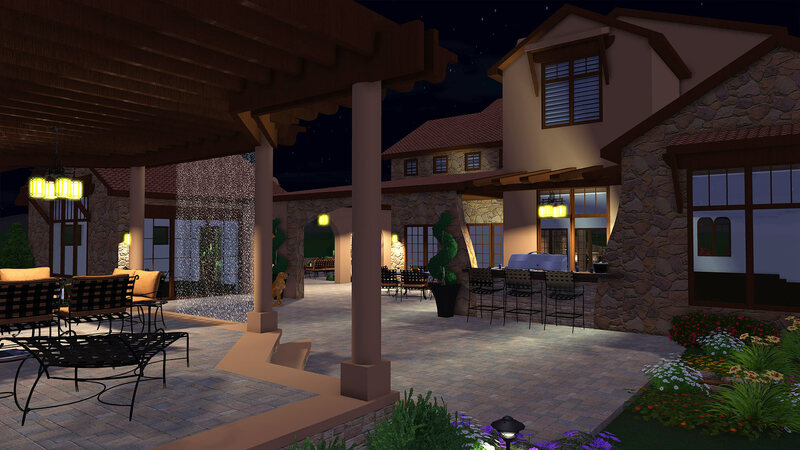 And you can do more than shift the sun and moon to show the changing time of day with Vip3D landscape design software. You can also create the perfect lighting experience with landscape lights, path lights, flood lights, and color-changing pool lights that will add an incredible new dimension to your presentation. Go beyond changing the time of day, and enter the location and the date to show your client exactly how the sunset might look at their next 4th of July barbecue. Share your ideas with the world. Simplify your social media workload and join the ranks of the most successful designers. 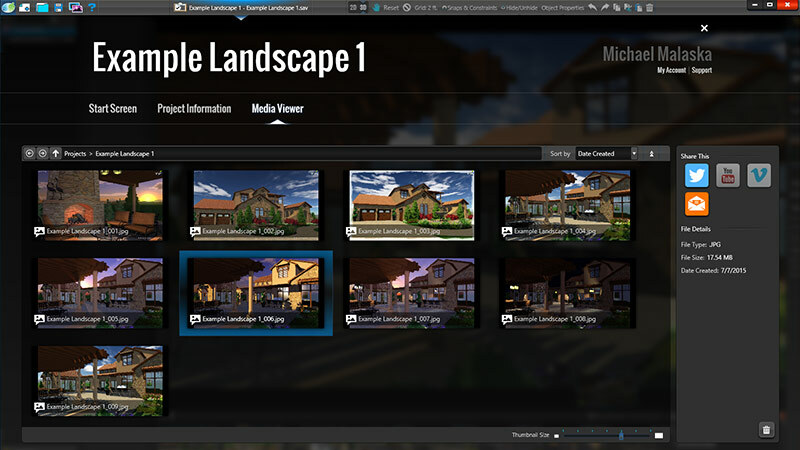 Let the powerful media tools in Pool Studio and VizTerra landscape design software help you create stunning images and immersive videos that you can instantly share on YouTube, Vimeo, Facebook, Twitter, or even via email. 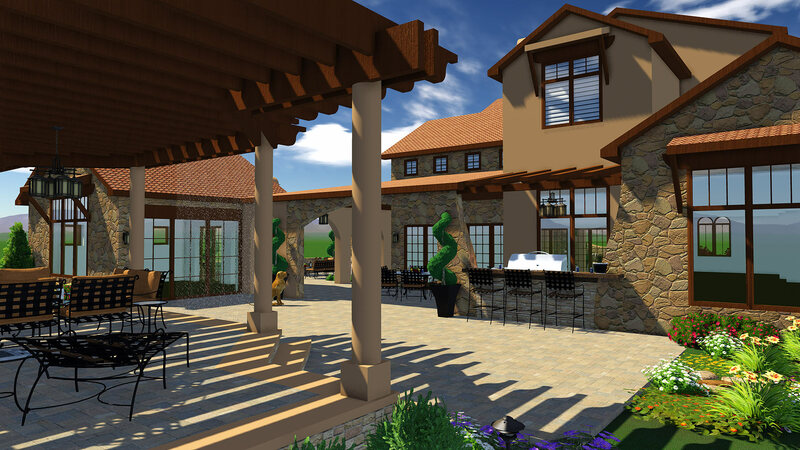 Whether you share in-progress shots or complete projects, you can use the easy pool and landscape 3D design software tools to help you market your ideas, build your brand, and grow your business. All without leaving your design project. 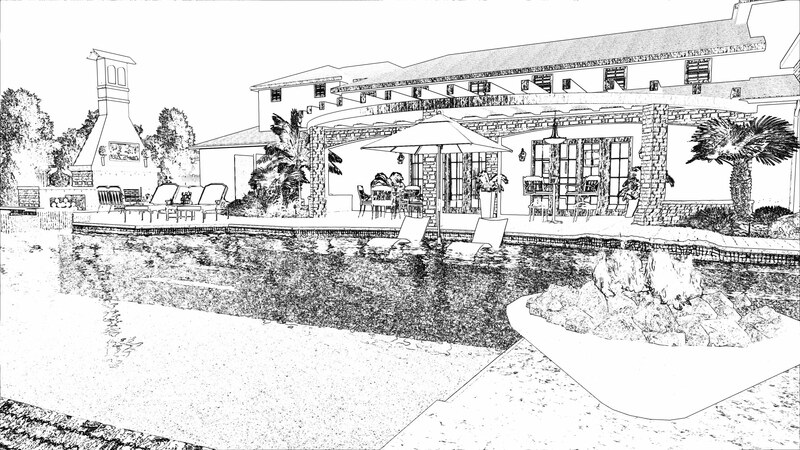 Your incredible pool, landscape or outdoor living design, transformed with a single click into a stunning work of art. Experiment with classic art tools — including watercolor, colored pencil, charcoal, and other options — as well as more than 19 built-in effects that you can customize to create your own hand-rendered style. The richness and depth that you add to your presentation offers your clients an unforgettable experience, one that is ideal to share with friends and family.